HURRICANE — A driver was transported to the hospital after a car slammed into her vehicle in the middle of State Street in Hurricane Friday morning. 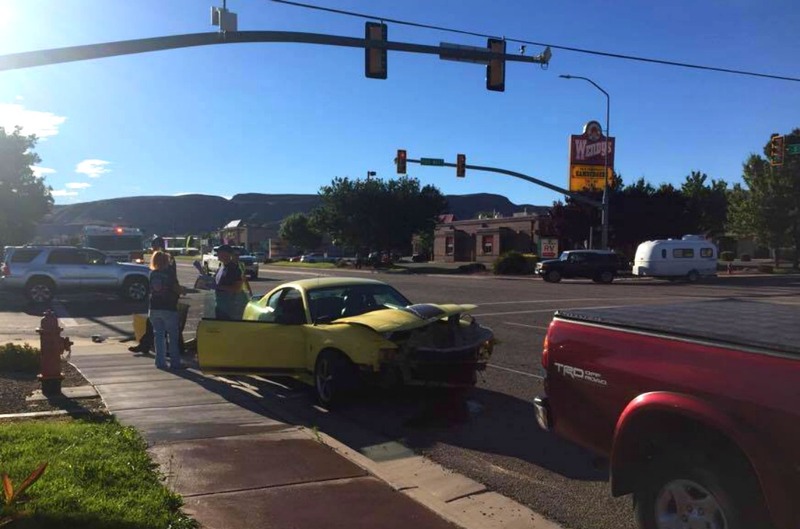 Shortly before 8 a.m. officers and emergency personnel were dispatched to a two vehicle crash in the intersection of State Street and South 1150 West. The crash involved a yellow Ford Mustang driven by a 58-year-old woman and a 42-year-old man driving a red Toyota pickup truck, Hurricane Police Officer Spencer Lundell said. Both drivers declined initial medical attention or transport to the hospital but the woman driving the Mustang later requested assistance from responding EMT’s, Lundell said. The woman told medical personnel she was experiencing chest pains and was then transported to Dixie Regional Medical Center in stable condition, he added. After speaking with both drivers and witnesses at the scene officers determined that the Toyota was heading west on South State Street as the traffic light turned red. The woman in the eastbound Mustang was in the middle of the intersection yielding for oncoming traffic, intent on turning left to head north on 1150 West, he said. Instead her vehicle was struck by the Toyota as she was making the turn. 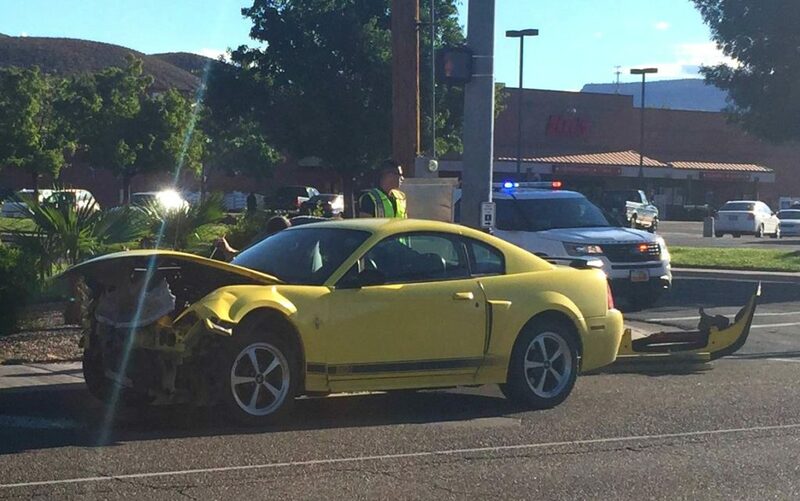 The Mustang was heavily damaged by the collision while damage to the Toyota appeared minimal. 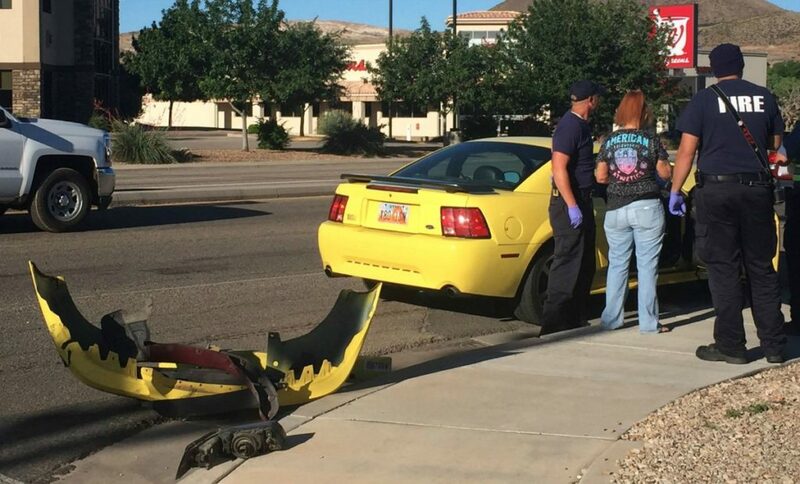 Both vehicles were moved to the side of the road to allow traffic to flow and the Mustang was eventually towed from the scene. The Toyota was driven away. Both drivers told officers they were wearing seat belts at the time of the crash, Lundell said. 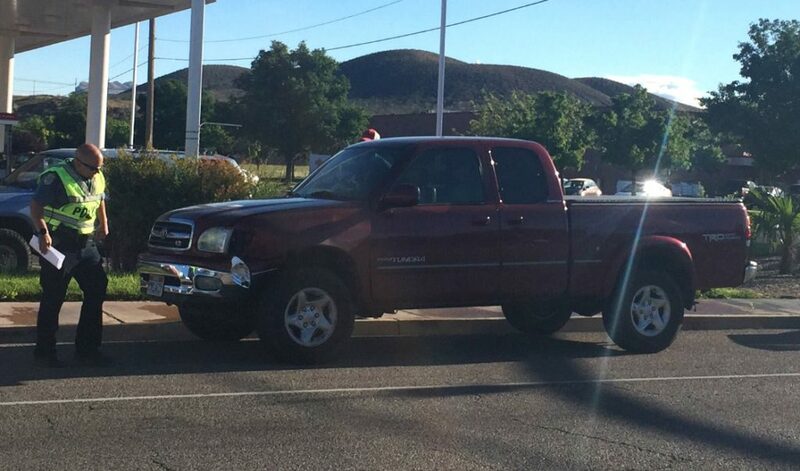 The man driving the Toyota was later issued a citation for failing to obey a traffic signal. “We seem to have a problem with the red lights lately,” Lundell said. Hurricane Police Department and Hurricane Valley Fire District responded and tended to the scene. These are two quotes from two different officers from two different accident stories (this one and the last one), both of them in hurricane. They are basically saying that red light running has become a trend in hurricane. The question now is: why aren’t these law men hitting red light runners with hard with tickets and stepping up enforcement to break this red light running trend? I think a nice plump $500 fine and a driver may never run a red for the rest of their life. So you are assuming that they (officers) aren’t hitting the red light runners. Obviously you did not see the HCPD Facebook post last month about officers working overtime to curb texting and driving and red light runners. The problem is it’s summer time and the majority of the 3 million visitors to Zion National Park are starting to show up on the roadways. Hurricane is also growing like a weed and with so many new residents and out of state visitor driver’s there’s only so much a small police department can do (what do they have? 20 officers?). 3,000,000 / ~20. I bet if they asked for a tax increase to add more officers people would be up in arms about it. As for the $500 fine, the cops don’t get to choose the fine amount and I’m kinda glad they don’t. You’re just making excuses for them. And why would they need a tax increase if “Hurricane is growing like a weed”? Do all these new residents not pay taxes and add revenue. HPD’s officers have it easy compared to those working in big cities. They can do better. The town has hardly any crime to speak of–they could practically dedicate 95% of their resources to doing traffic. I agree with you Comments. When I moved here 15 years ago I was impressed by the cops in the Hurricane area by their enforcement tactics and you saw people pulled over all the time, and people drove slow, cautious and respectfully. Move forward to today and the SR-9 highway is a dog eat dog stretch of road. Inconsiderate drivers all about intimidating driving if your doing the speed limit look out! It is not uncommon to see groups of cars out there doing 65+ and the 50 MPH limit at the chevron corner is a JOKE. I seldom see police posted up on that corner. You would think, especially with a death at 3400 a few months back that enforcement efforts would have picked up. I know that the Hurricane police department is quite a bit larger now but it seems like you see less of them posted up on this road slowing people down and correcting poor driving manners. I actually despise the hurricane PD from an event that occurred a few years ago. It actually was something very minor, but their attitudes and disposition were simply unpleasant and rude. Redneck, bully, small-town hillbilly cops in a redneck good ol’ boy’s club was my impression. Maybe they’ve gotten better since then, but it’s doubtful. I’ve dealt with stg PD and laverkin PD and they were always very pleasant. I don’t know what it is about hurricane. Maybe I just happened to deal with 2 of the very worst. And yes, I’d like to see more traffic enforcement everywhere in this county, and if they’ll actually write tickets (and not let them off w/ a warning because they know them from church) then the revenue will more than pay for the extra enforcement. Running a Red light has become “All the Rage” nowadays here in good ol’ southern Utah, how about kicking some real …* with a $750 fine and a few days in lockup? Stop these stupid …* before they kill someone….